Object-Oriented Design with UML and Java provides an integrated introduction to object-oriented design with the Unified Modelling Language (UML) and the Java programming language. The book demonstrates how Java applications, no matter how small, can benefit from some design during their construction. Fully road-tested by students on the authors' own courses, the book shows how these complementary technologies can be used effectively to create quality software. It requires no prior knowledge of object orientation, though readers must have some experience of Java or other high level programming language. 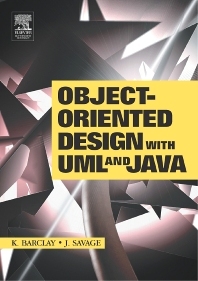 This book covers object technology; object-oriented analysis and design; and implementation of objects with Java. It includes two case studies dealing with library applications. The UML has been incorporated into a graphical design tool called ROME, which can be downloaded from the book's website. This object modelling environment allows readers to prepare and edit various UML diagrams. ROME can be used alongside a Java compiler to generate Java code from a UML class diagram then compile and run the resulting application for hands-on learning. This text would be a valuable resource for undergraduate students taking courses on O-O analysis and design, O-O modelling, Java programming, and modelling with UML.